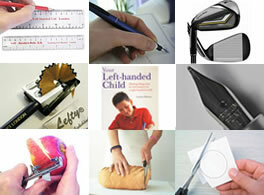 How Will You Celebrate Left Handers Day? What Happened In Previous Years? Press Release: I’m Left-Handed, What’s Your Superpower? 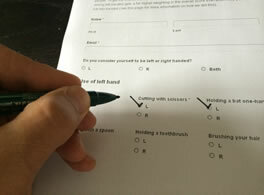 If you haven’t completed the left-handed test yet, you can use this link to go to the survey form (it contains 12 Left/Right questions and will only take you a minute to complete). Do you consider yourself to be left or right handed? Of the 5,398 people who consider themselves “Both handed”, 60% use their left hand to write, 30% to cut with scissors and 67% used a phone on their left ear. Their overall weighted score was 55%. Please add your own comments or interpretations as comments at the bottom of this page. I am a lefty and scored 91 % on the test. My parents are both right handed but my Dad’s mom could use both equally well. I had a right handed husband and my 4 kids are all right handed. Kind of sad I didn’t get at least one left handed child. Interesting quiz but like many things we are forced to use our right hands. I use a calculator with my left hand but use a computer number pad with my right because it is on the right side. On the phone I use my right ear with my right hand so that my left hand is free to write notes. Another question is which hand controls the mouse I use my Left. Confuses the right hand people. I noticed the other day that I crack my eggs into a jug which I hold with my right hand while whisking with the left. But after pouring the egg into the pan I hold the jug under the tap and whisk it clean with my right hand. Odd! Thank you for the interesting stats. I have a few points. I scored 96 with the one out being arms folded. Since it’s not a functional action it’s interesting but not convincing to me since I’m very left handed. I also think that Eyes, Ears and Feet really fall into separate categories since they seem to be independent of manual dexterity. In paticular use of the left ear for phones seems very common (to me at least). PS I’m a cricket tragic – many people bat reverse to their dominant hand – this seems to be random. Nice test. But the younger the person the more likely the more left handed they will be, before they have to learn to change over to using the right hand more and more in life due to all things in this country being designed and built for the right handed user. When people say “turn right” to me, I do an automatic left turn and vice versa. My left hand to others is a right hand to me. Is it backward? No. Just different. Help left handed children by using a mirror to convert right to left. Works for most. My famiy is known by generations for being left handed. Left handedness skips generations in my family where my grand mother, her brothers,my cousins , and myself Rakshith are left handed by birth . We have gone through a lot of humiliation and pressure of changing our hand to right for writing and eating food. I was raised by 2 right handed parents, have 3 older right handed siblings and one younger right handed sibling. I am dominently left handed for anything I learned on my own. However I was not allowed to be left handed for most anything that was taught. I even had to eat with my right hand. So I consider myself left handed. But know I am both. I was treated kindly in school for being left handed. My 4th grade teacher saw fat I struggled with slanting letters the wrong way so after school she showed me how to turn my paper so I could write correctly. My mother and father knew I love to sew so they bought me left-handed scissors which were hard to find. My dad was left-handed so he bought me a lefty baseball mitt. He was left-handed too and we loved to play catch. Through this life some people thought I was hard of hearing or slow because when I answer certain questions, I have to think right-handed then translate it to my left-handed world. In the end it’s actually been useful and to my advantage to analyze and see things in both the left and right-handed world! As teenagers, my brother told me I am a militant lefty. I have since carried that mantle with pride. My husband is a righty. We have a lefty daughter and a righty son. As an adult, my Dad has teased me regularly about handedness. I tell him he’s just jealous that he’s a boring righty. ...Or is it just a left-handed thing!